5 Keto Tips For Success! Whether you're new to the Ketogenic diet or have been following this lifestyle for years, these 5 tips will benefit you tremendously! 1. Keep Your Fats High and Your Proteins Much Lower. Most people are used to consuming lean proteins in their diets, however, too much protein (more than 25% of your daily nutrition) will kick you out of ketosis. Make sure to consume fattier cuts of meats opposed to leaner cuts and always cook with butter or coconut oil to boost your fat in take. 2. Take MCT Oil Powder Once or Twice Per Day to Pack on the Healthy Fats! MCT's, or Medium-Chain-Triglycerides, are fatty acids that are derived from sources such as coconut oils and butters. They are the most important fatty acids you can add to your diet in order to get into and maintain a nutritional state of ketosis. MCT's are easily broken down by the body and aid in the production of ketones, providing a number of benefits such as improving brain function, protecting heart health, and igniting fat loss. 3. ON KETO YOU'RE LIKELY NOT GETTING YOUR VEGGIES!! Add Powdered Greens to Your Diet. Most of the vitamins & minerals we receive in our diet can come from fruits & vegetables and unfortunately these foods will kick you out of ketosis. We suggest supplementing with a Greens Powder or Multivitamins. Some powdered greens have MCT's in every scoop! As it was mentioned earlier, MCT's boost your ketone levels and enhance the effects of the Ketogenic diet. 4. Stay Hydrated and Add Salt To Your Diet. When the body changes over from using glucose to ketones as it's main source of fuel we may experience what is called the Keto Flu. One of the best ways to do this is to add more potassium and sodium into our diets. Flavor your food with pink himalayan salt or supplement with beta-hydroxybutyrate to overcome the Keto Flu much more quickly. With any change in your diet, especially lower-carb diets, your bodies immune system and gut health can be compromised. Adding sufficient amounts of probiotics to your diet will fix this problem. However, most people go wrong by adding probiotic sources to their diets that raise their blood sugar and unknowingly kick them out of ketosis. This can be avoided by taking sugar-free probiotics. If you're new to taking supplements that enhance the benefits from a Ketogenic lifestyle... we've got you covered! The ultimate supplement in improving brain function, increasing energy, controlling weight, and increasing ketone levels. 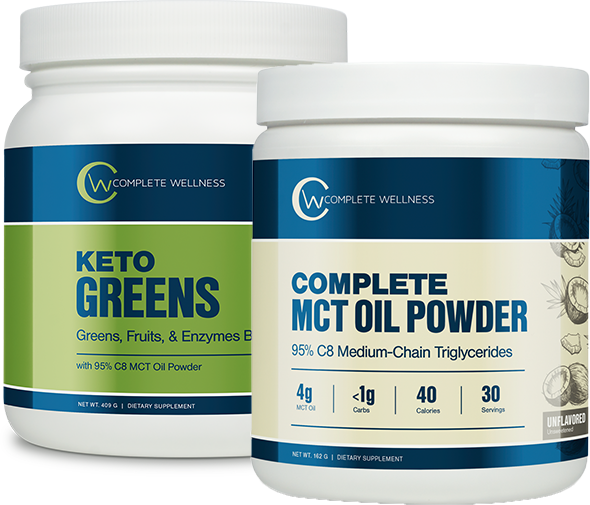 Taking MCT's daily is the quickest way to get into Ketosis! This perfect blend of ingredients nourishes your body with essential vitamins & minerals that are otherwise difficult to consume on the Ketogenic diet. 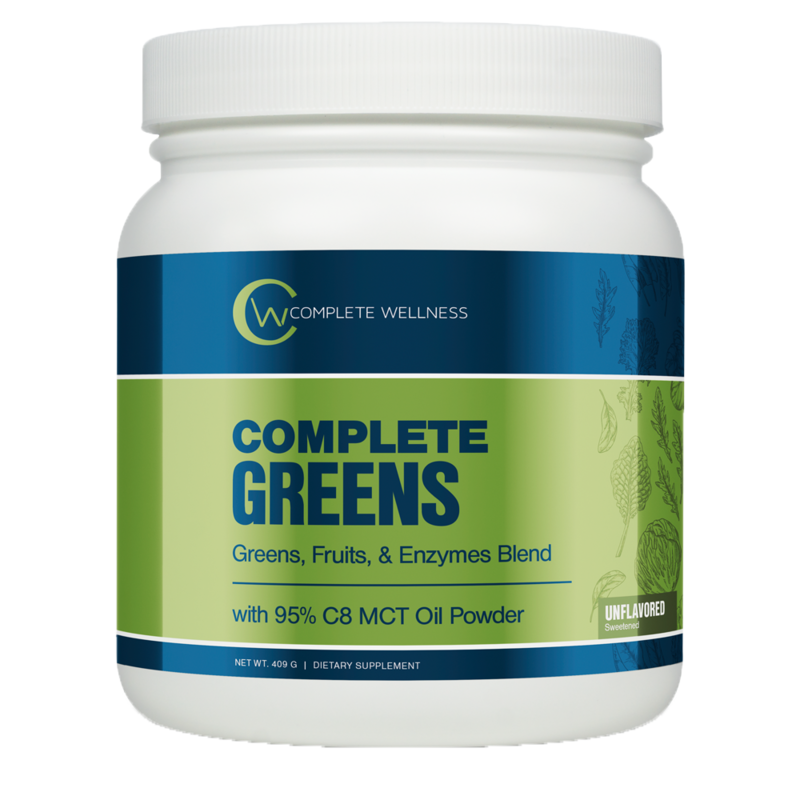 We also paired these greens with MCT's & Digestive Enzymes. Probiotics are highly recommended during any major change to your diet and for improving long-term health. Probiotics help you get the most out of your nutrition. We understand that supplements come SECOND to nutrition, however, taking the right supplements can help you accelerate weight loss, increase your energy levels, and get you into KETOSIS faster! Breaking through the "Keto Flu"
You've decided that you want to make Keto a TRUE lifestyle change and congratulations on coming this far! 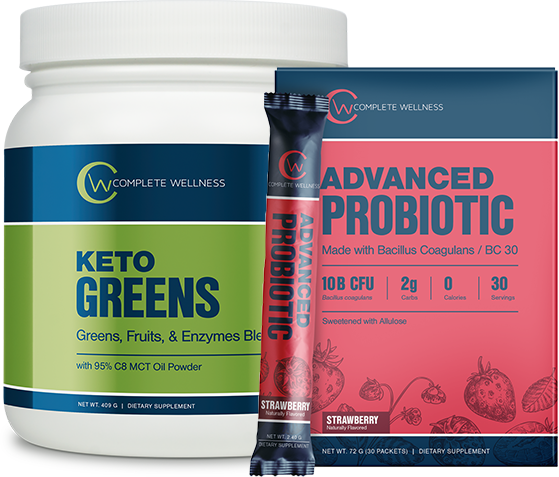 Well, here at Complete Wellness, our goal is to give you all of the tools you need to find healthy, long-term success with this incredible lifestyle! 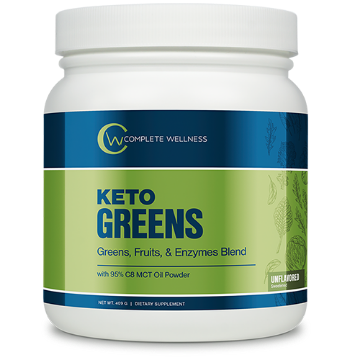 The Complete Wellness Keto line of supplements was put together with the Keto beginner in mind. We understand the struggles that most go through in their first few weeks of trying out the Ketogenic diet because we've been there ourselves! With proper nutrition, implementing these important tips & tricks, & supplementing correctly, going Keto can be the greatest thing that you ever do! We like to think of Complete Greens as insurance for your body, it’s peace of mind, knowing that you are protected & fortified from the inside out. Your health is important but it's not something you should stress about every minute of your life. So, with each serving, mix, drink, and then forget about it. By combining our Greens with proper dieting and exercising you can rest assured that your body is being well taken care of. We understand how difficult & expensive it can be to get in all of the daily micronutrients that we need. Fruits & vegetables can be tasteless or full of roundup and other pesticides that wreak havoc on our bodies and a lot of times this deters us from eating these “healthy” foods. Our solution is a combination of 16 organic whole foods that completely supplement your shopping trips to the produce isle. What many people fail to realize is that what we consume is not always completely digested and absorbed effectively by our bodies. We take care of this by adding digestive enzymes & C8 MCT’s to our greens for better nutrient absorption & lasting energy. 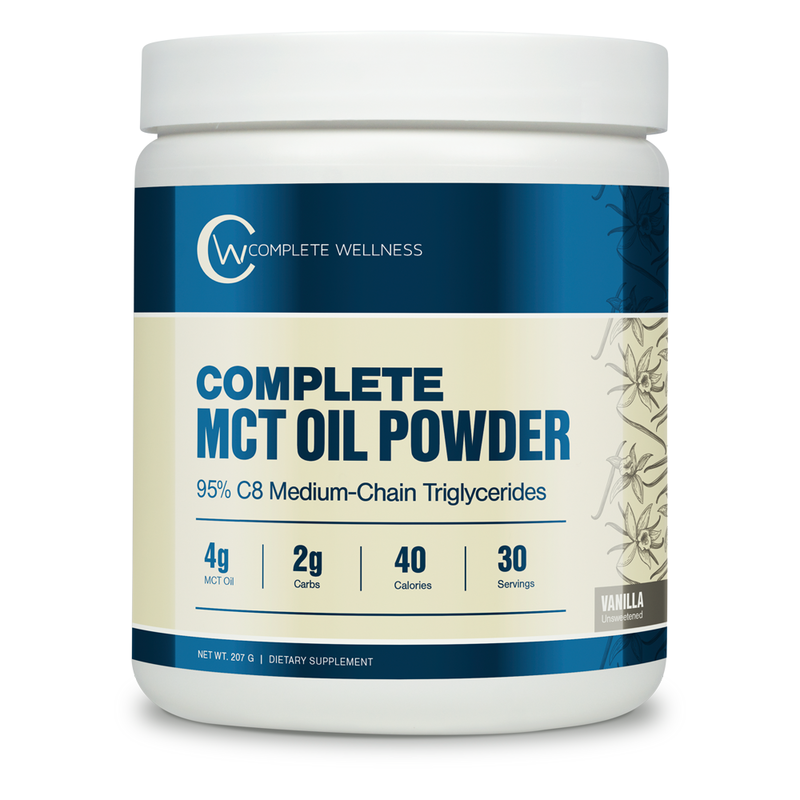 MCT’s, or Medium-Chain Triglycerides, are fatty acids that are craved by the body for a number of incredible reasons. They are rapidly absorbed by the body and converted into fuel for almost immediate energy. They have profound effects on brain function and overall health as they act as a natural antibiotic for the body. MCT’s are broken down into “ketones”, a more efficient energy source above glucose. 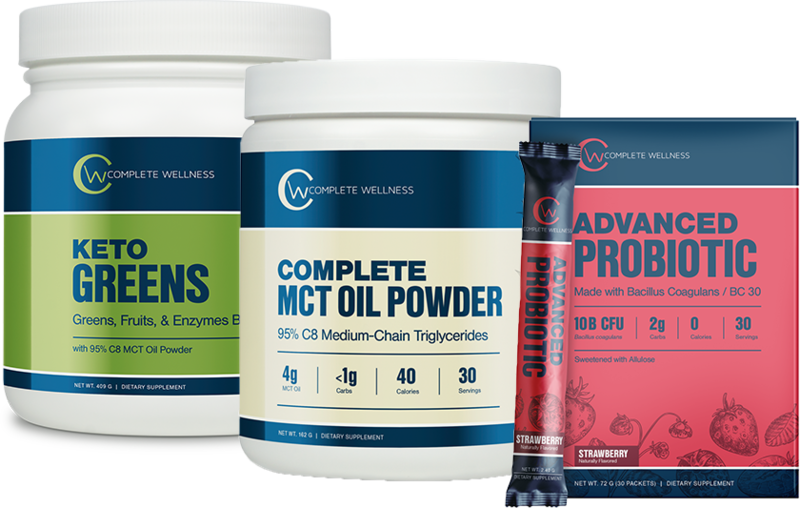 MCT's can be found in foods such as butters and coconut oils, however, these foods contain multiple forms of MCT's, including quickly and slowly digested MCT's. Slowly digest MCT's can eventually be stored as fat on the body whereas quickly digested MCT's are almost immediately converted into energy by the body making them impossible to be stored as body fat. For that reason, supplementing with a MCT product, such as Complete MCT Oil Powder, is beneficial for receiving all of the health benefits, while simultaneously burning body fat, instead of storing more! Everyone should be taking some form of probiotics.. Why? Our digestive system is closely tied to our overall health, in fact, the majority of our bodies immune system is located in the intestines. When BC30 from our Advanced Probiotics is consumed daily, it creates a healthier intestinal environment, which supports immune function and keeps us healthy. Probiotics are an important part of our immune system and are integral to our overall health. Having a robust and diverse microbiome is important in preventing and treating many types of diseases, not just those that are a result of infection. In fact, good bacteria is largely responsible for proper digestion, infection protection and even neurological health. 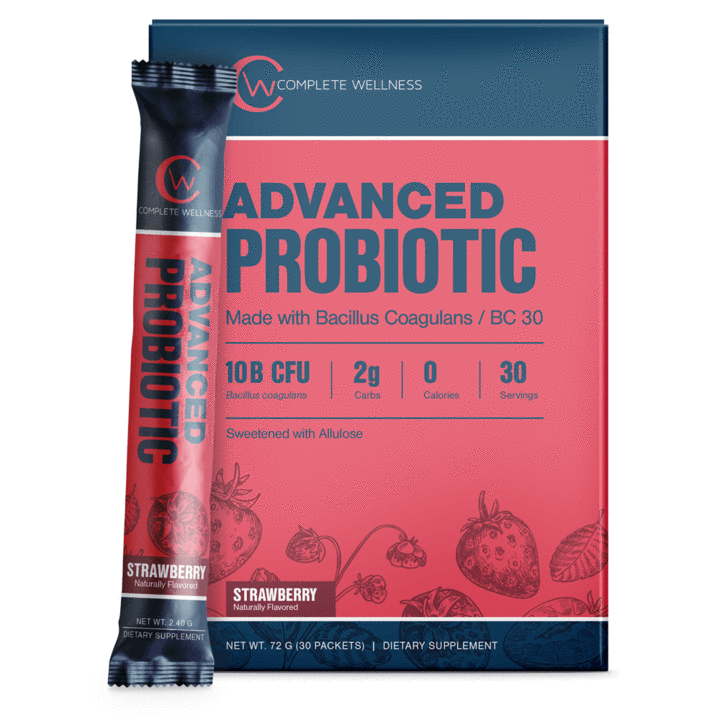 Advanced Probiotics are made with Bacillus Coagulans, or BC30 which are probiotic organisms that can survive harsh conditions due to their ability to form a protective protein shell. From this they are able to survive the entire digestive process, creating a healthier environment throughout our entire digestive system! Are You Ready To Experience Stronger Success With The Ketogenic Diet? 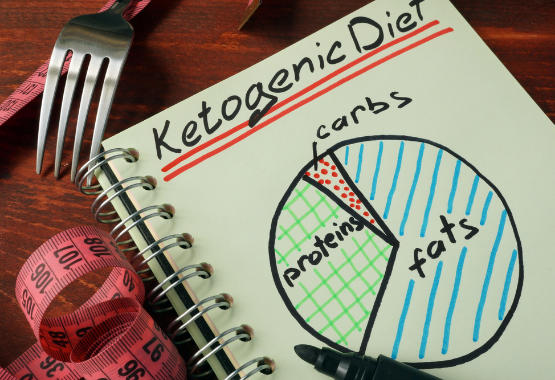 Everything You Need to Maintain a Ketogenic Lifestyle! All of our products are Made In The USA, Vegan-Friendly, Gluten-Free, & made with all Non-GMO ingredients. If we wouldn't take it ourselves then we wouldn't want you to either & that is why we formulate our products with the highest quality ingredients you can find. Boost your ketone levels with the most important fatty acid you SHOULD be adding to your diet. Complete MCT's utilize the highest forms of MCT's on the market. Protect your body with the perfect superfood blend of nutrients for Keto success. 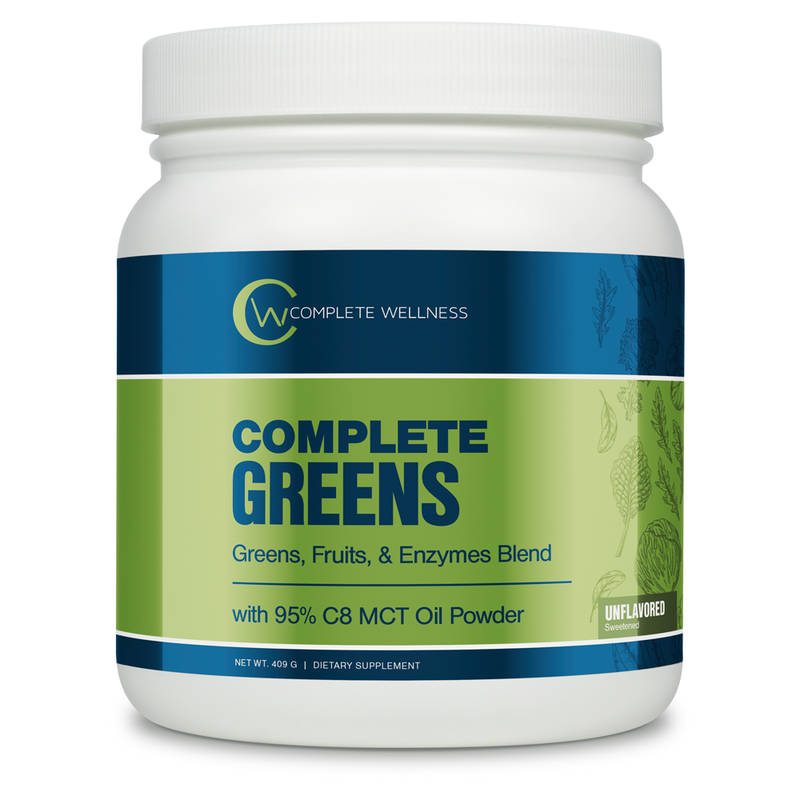 Each scoop of Complete Greens contains MCT's, digestive enzymes, and the vitamins & minerals your body craves. Achieve & maintain digestive balance as your body transitions into a nutritional state of ketosis. 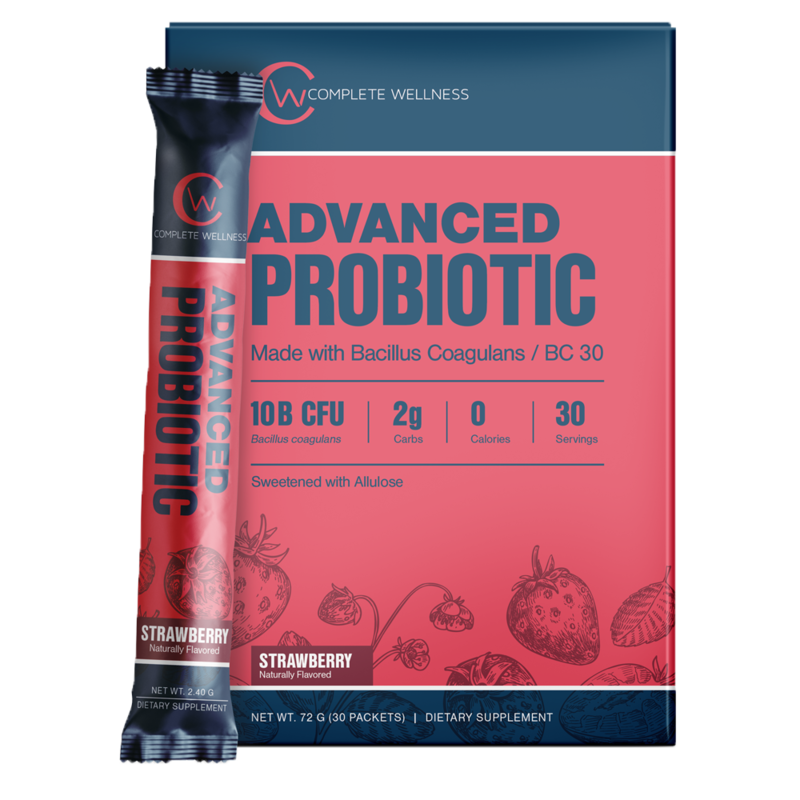 Formulate with BC30 and a low-calories sweetener for taste, Advanced Probiotics last the entire digestive process and will not spike your blood sugar. If you're looking for the next step in improving your health, well look no further. The Complete Bundle was designed with you, the health enthusiast in mind. Each product has been uniquely formulated to simply for your nutrition and offer a convenient solution to maximizing the results of Ketogenic or any other healthy lifestyle while also making drastic improvements to your overall health! I am one month into Drew's Keto Jumpstart program and let me tell you... after this month of results, I trust Drew with my life. LOL His Keto guidance and supplements have made my weight loss journey so much easier. I've tried Keto a few times, but never found as much as success as I have until now. Finally! These are the products I've been waiting for! I've tried other green juices that have tasted gross.. but these taste amazing. I also didn't realize how important these probiotics were until I started taking them. They've made a world of difference on how I feel ! THANK YOU DREW & CW! For those who know Drew and his F2F2F story, then you know how much he cares about taking care of his clients. Thank you for coming out with products that are created from organic, non-gmo ingredients, that taste great!